Many books and articles have been written about these three factors, and they are thankfully receiving increasing amounts of mainstream media coverage. This article attempts to briefly summarise the state of play in each area, from a particular perspective – that of the currency designer envisioning new currencies that might avoid the excoriating societal, economic and ecological impacts of such built-in dysfunction on future generations. Interest can be seen as capital-rent. Funds flow from a lender with more money than they curently need to a borrower with less money than they need. By definition the interest flow is from the poorer to the richer. So rather than the ‘trickle-down’ effect once postulated, we have a ‘trickle-up’ effect. In previous ages the power imbalance in the borrower-lender relationship has been partially addressed via debt forgiveness (jubilees) and through bankruptcy law. The current neoliberal-designed narrative emphasises the primacy of the debt – the ‘free will’ of the borrower and the unfairness of any write-downs to the lender. Thereby all lenders have licence to be predatory. Now if the lender is a hard working self-made person, simply ‘parking’ money for a period of time until it is needed, then there is perhaps some rationale for capital-rent. At a guess, such loans might account for perhaps 0.1% of credit. Typically 99.9% of loans will come from two source-types – the smaller portion from inherited wealth pools where the initial accumulation of wealth is a result of historical serendipity, the smart commerce of previous generations or malfeasance (or a combination thereof), and where wealth-possession implies no merit for the current holder whatsoever; and the larger portion from private banks who create the credit out of thin air . This latter category is the subject of monetary reform proposals which would see the state reclaim (at least partially) the right to issue money  – a right it has outsourced to the commercial banks as part of an undocumented and opaque ‘bargain’. The bargain appears to be based on two foundations – the banking sector’s ‘agreement’ to operate payment and settlement systems (which could in fact be handled via a neutral third party); and the political attraction of the state being able to wash its hands of difficult strategic decision making and leave all investment decisions to the ‘market’ (or the banks as a proxy for the market) – which is the subject of the following section. (I say ‘appears’ because to my knowledge the exact nature of this bargain has never been formally described.) 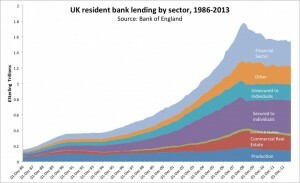 It has been estimated that in the UK alone GBP 192 million is paid by the nation to the banks in interest every day . This ongoing seignorage represents a wealth transfer into the pockets of the high priests and gatekeepers of finance – a key factor in the creation of a terminally divisive society. And a factor which is relegating the real economy to a smaller and smaller corner of the casino. For chapter and verse on the truly horrific effects of debt+interest, the reader is referred to the writings of Tarek el Diwani and the late Margrit Kennedy . Kennedy has debunked one particular myth about interest – that it only affects those who borrow. Her work calculated the embedded interest accumulated in the supply chain of various goods and services and showed that it is quite common for 50% of a price to be due to interest costs. At this point we will resist the temptation to disentangle the idea that the cost of money – i.e. the interest rate – is related to the level of risk involved for the lender. Suffice to say its complete b******s. Interest rates are more a measure of insider-status than of forensically-assessed-risk. The two functions of means of exchange and store of value should be clearly separated when it comes to the design of new money-forms. For a ‘pure’ exchange currency the primary interest-related issue is the question of whether to implement a negative interest (demurrage) regime (or to design-in alternative treatment of relatively inactive currency units). The underlying assumption to this line of thinking is that increased ‘local-GDP’ is good. (Note: ‘Local’ here needn’t necessarily mean local-geographic – more Preferenced-Domain  specific). In other words more trade is good, so the velocity (frequency of exchange) of money-forms needs attending to. But we know all about the Growth Illusion , the impossibility of infinite growth and the disconnect between GDP type measures and well-being. So it can be argued that buying in to this underlying assumption is itself to take on board some of the neoliberal ideology we are aiming to dump. However if a new currency is predicated on preferencing real world ‘core’ transactions (food, shelter, energy, society) then perhaps growth in currency turnover could be a meaningful metric. With this proviso, we can explore further. ii) There may be (especially in the early stages of a new currency) nothing that the holder wants to purchase available. Thus incorporation of demurrage in immature currencies is probably ill-advised. Given these issues, plus the danger of succumbing to growth fetishism (or the ‘ideology of the cancer cell' as it has been described), caution is advised. Successful use of demurrage has been reported by the German Chiemgauer currency but this appears to be measured in terms of velocity – three times that of the Euro as reported in 2009 . However, it is possible that the currency is being used for local transactions that would have taken place otherwise in euros, so that the overall velocity of exchange in the local economy is in fact unchanged. Proving real ‘additionality’ looks to be tricky. But then maybe it’s not necessary to do so. The demurrage creates a small revenue stream that can be partially diverted (as with the Chiemgauer), to non-profits. And with the recent conversion of the previously dismissive European Central bankers to the idea of negative interest, maybe Gesell was ahead of his time. In a store-of-value context, interest can be used as a mechanism for incentivising the setting-aside of money – as an asset class in its own right. But the money thus set aside is then further invested (by someone) in other asset classes, so in currency design terms I prefer to see store-of-value currencies backed by something tangible and of enduring use-value, ideally energy. Lastly, all currencies will need working capital at some point. For digital currencies this is best achieved via the transaction fee mechanism. Interestingly this mechanism is part of the smart incentive design of Bitcoin. At present mining incentives are the major reward, but as the currency matures, transaction fees will gradually overtake them in importance. Creating a separate store-of-value companion currency for a designed exchange currency might well be an interesting direction, but not with interest as its key value enhancement device. As noted above, the lion’s share of issued money appears in the form of credit allocated by private banks. It may be harsh to say these funds are allocated on a whim, but there is certainly a herd-mentality, and the idea that there is a competitive money-rental market mediated by independent minded banks via the interest rate charged is an illusion. The end result is that insufficient funds are made available to the real economy. Most goes to the financial sector and to secured personal loans, largely mortgages. In theory this allocation is guided by a risk-weighting process underpinned by the Basel agreements. Different weightings are defined for different generic asset categories – government bonds being the ‘safest’. The key point here is that there is no strategic guidance on capital allocation. Governments therefore are showing an implicit blind faith in the ability of markets (or banks as their proxy) to determine what is best for us and for following generations. This ‘social experiment’ has lasted now for around 45 years and in the words of Wren’s epitaph at St Pauls ‘si monumentum requiris circumspice’ . Thanks to the reforming efforts of Positive Money and other pressure groups, the case for so-called ‘sovereign money’ is reaching a wider audience but the inertia of entrenched vested interest and the political expediency of being able to delegate national investment strategy to the ‘markets’ represent enormous obstacles to change. We must hope that this market supremacist phase of capital is temporary. As noted above all new money-forms will have need of capital at some point for development. If at this stage they are forced to return to fiat currency markets to borrow, they immediately become dependent on a competitor. Whether this dependency prevents the new money-form from achieving its objectives will depend on those objectives, but it is likely to act as a constraining influence. The gradual accumulation of capital via embedded transaction fees is preferred but this means that the hard yards have to be put in to achieving critical mass in an old-fashioned save-and-invest sort of way; and that unless goods and services can be sourced via payments in the new currency, they are not acquired. Development is postponed. In this context smart strategies for bootstrapping a currency into sustainable existence are clearly needed. When sufficient capital has been accumulated, the focus then turns to governance. New currencies must design-in governance mechanisms that are transparent and fit for purpose. The ‘Proxy Pounds’ or Transition Currencies are backed by fiat – that is the Brixton/ Bristol pounds are issued in exchange for sterling. The sterling received is then ‘banked’ and a proportion can be loaned out to local borrowers. But unless interest is charged on those loans, the lending risk cannot be covered and scheme costs (which are generally payable in sterling) cannot be met. The interest ‘problem’ is linked to the capital accumulation ‘problem’. The TMOE mindset is related to the 1980s consulting mantra that ‘if you can’t measure it you can’t manage it’. Both display a complete disregard for the ineffable. It is difficult to argue a case for the complete abolition of metrics, but it is a rare metric that is widely accepted as an unambiguous measure of something that matters. Putting a numeric value to an entity can lead to unintended and unpredictable side-effects as experience (for example with the NHS) has shown. Numbers can also be gamed by insiders with a vested interest in specific outcomes. Money’s function as a unit of account – as a yardstick – a measure of comparative economic value – shares some of these challenges. Perhaps the two main money-related metrics are personal-wealth and GDP. The first has become a fetishised proxy for personal-worth; the second is widely accepted to be unrelated to happiness/ well-being. War and car crashes are good for GDP. Attempts to identify a more meaningful index have led to work on the ISEW , GPI and the German NWI . This process normally involves putting a numeric value (in money terms) on social and ecological parameters. The dominance of money-measures in the shaping of economic policy has led to this ‘quantification’ approach being applied to many aspects of life not heretofore addressed by economics – to the ‘price’ of carbon, to the ‘value’ of housework and so on. Commentators talk glibly about natural capital, social capital, human capital. The quantification juggernaut is a key facet of the extension of markets into areas not previously treated as such. The market economy has become the market society. The classic neoliberal response to a failed market is to create a new market to address the failure, and money-metrics are central to this process. The idea of the perfectly functioning market is a deeply attractive one. The invisible hand ensures that goods and services are traded at the right price, and, like the subcontracting of money-issue to the private banks, absolves the politicians from having to trouble their tiny minds on strategic human priorities. Unpopular outcomes can be attributed to the mysterious workings of the ‘deus-ex-machina’ of the market. This cloak of machine-like impersonality in turn can be used to obscure the influence of the puppet-masters. In the process we all adopt the language of the market and its prevailing narrative without realising it. It’s a shame such a market does not exist. Quantification is also an important ingredient for the agnotology  central to neoliberalism – the spreading of doubt and uncertainty in order to paralyse meaningful citizen action while strings are pulled and neoliberal ducks lined up. There’s nothing better to argue over than numbers, their meaning and consequences. Exchange currencies – beyond the gift economy and simple barter – need a unit of account. So, whatever that is, there is a numerical representation of an account balance. As long as the rules concerning the exchange of these units are clearly set out; that non-trade uses for the currency (e.g. exchange with other currencies, fees) are transparently understood, and the underlying payment system is secure, then this particular metric is fine. Over and above the individual transaction, however, there is an ongoing process of development of the community-of-users of the currency. This process involves the reciprocal assessment of various soft factors, of which the most important is probably trust. We have recently seen some hyperbolic claims that Bitcoin does away with trust, and articles on trusting vs trustless schemas. But Bitcoin has not done away with the need for trust – it has moved the trust boundary. The blockchain manipulation algorithms allow the emergence of consensus as to whether or not payment has been made. Further development of cryptocurrencies – for example the determination of embedded contract conditions – will probably move the trust boundary further out. But they will not do away with it entirely. Some of the existing ecommerce platforms address the matter of trust via a reputation metric. Reputation can be seen as a qualifying parameter. There may be people with the goods/ services you need (or the requisite units of currency) that you choose not to do business with. The reason is usually related to some facet of reputation. I hope to cover this more fully in a later article. But when reputation is expressed via a metric, it can be gamed. The last family of ‘gameable’ currency-related metrics relates to the use of incentives in currency design. In other articles I have suggested that one aspect of behaviour-change-via-currency is the identification of various pro-currency behaviours  or achievements and their reward via new currency issue. Some of these triggers might be one-off events (e.g. recruiting a new member, recommending a new local source), but much of the thinking in this area has been around increasing activity levels. This type of reward can be gamed via fictional circular trading. And we also find ourselves back at square one if we incentivise the local-GDP of the currency irrespective of transaction ‘quality’ – its correspondence with the Preferenced Domain . There are a number of ‘ways-in’ to the design of new money-forms. Identifying problem areas of mainstream money and then seeking to avoid them by design is but one. Interest payable on credit is associated with never ending growth. New currencies will need to be more attuned to stability and ‘right-sizing’ than to the ideology of the cancer cell. So different ways of accumulating capital, allocating it productively and dividing the value-added are needed. Embedding transaction fees seems a promising way of achieving this, together with fair and transparent governance that can adapt to changing circumstances. But steady incremental organic growth (or indeed degrowth) requires patience and doggedness and is culturally alien to the dominant wham-bam entrepreneur-lionising value-set. Convertability with mainstream money can ease a start-up but it creates a dependent relationship that is difficult to break. The new money-form child never leaves home. The road less travelled will involve a purposeful separation from mainstream money with consequent challenges for building critical mass and, when maturing, some form of capital controls to isolate or at least moderate harmful interactions. Lastly, while metrics can perform a useful input to developmental discussions, an awareness that many of the important things in life cannot be expressed numerically will be useful. Judgement must be applied – in a transparent and pre-agreed way by a community of users. We cannot, using digital technology or otherwise, create an adequate money-form that is 100% algorithmically self-managing. Graham Barnes is a Currency Innovation Strategist. He is a Director of Feasta and co-organiser of the Feasta Currency Group. He holds a PhD in Computer Science and worked at a senior level in IT and online marketing in a previous life. His current projects include the design and delivery of currencies to be sponsored by a local authority; by a social entrepreneur to complement and enhance a well established sustainability methodology; and by a restaurant chain.